Carolina at Atlanta – With a win the Panthers can clinch the NFC South title, secure a first-round bye, and possibly get home-field advantage throughout the playoffs if Seattle loses. However, Atlanta has not been a pushover late in the season, especially at home, so despite the disparity in their records, it won’t be an automatic win for Carolina. The Falcons are the worst rushing team in the league, but if they can get Steven Jackson going, they’ll have a chance to keep the game close and put some pressure on Carolina, who is one of the best teams in the NFC, but they’re also a team that hasn’t had to handle success before this season, so it’ll be interesting to see how the Panthers play with a lot on the line. 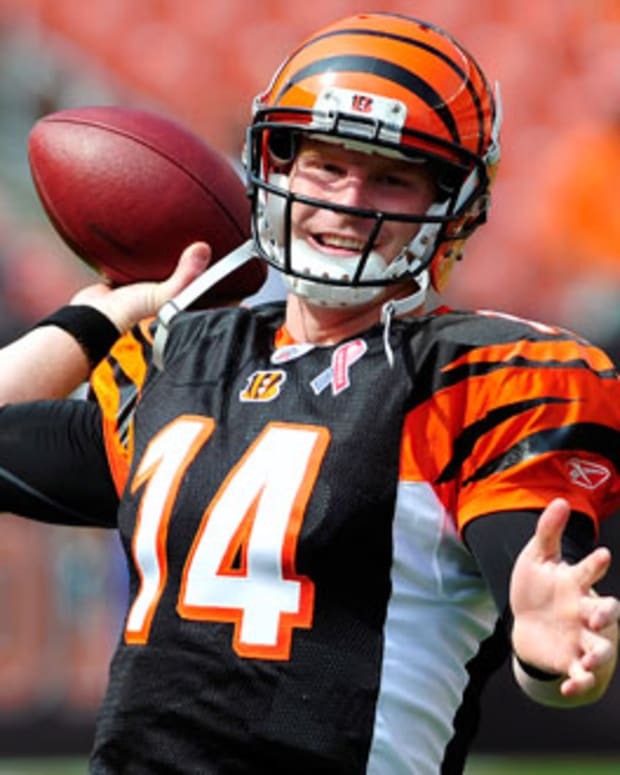 Baltimore at Cincinnati – The Bengals have a chance to earn a first round bye with a win and a New England loss, which would give their postseason hopes a huge boost. They’d also like to avenge an earlier loss to the Ravens, and at home they should be expected to win. As for the Ravens, there are a lot of scenarios that will get them into the postseason, but most require them winning, and there’s no way they’ll win if they play like they did last week. The Baltimore offense needs to get its act together and not put the defense in a bad situation like they did last week, as it’ll be tough to keep the Cincinnati offense out of the end zone for four quarters. Jacksonville at Indianapolis – A lot needs to happen for the Colts to get a first round bye, but after some unsavory play during the latter part of the season, it’d be nice to enter the playoffs on a three-game winning streak, so they need to secure a win even if there’s nothing to gain in the standings. The Jaguars have shown that they can stay competitive with good teams, so the Colts need to take them seriously or else they could struggle to come away with the win. Andrew Luck and the offense should be fine, but the key for Indy is their defense, which has only given up 10 points over the past two weeks, and needs to keep that going with the postseason approaching. New York Jets at Miami – The Dolphins will need some help to get the playoffs, but they’ll also have to win, which isn’t a certainly after the way they played last week against the Bills. Miami dominated the Jets less than a month ago, but Gang Green has played better since that game and started to find their stride offensively, which could be a concern for a Miami defense that doesn’t exactly shut down opponents on a regular basis. This game could come down to Ryan Tannehill’s health and his effectiveness after a disastrous game last week. Look for Rex Ryan’s team to come out loose and excited to play spoiler, and if the Dolphins come out tight, they could be in trouble. Cleveland at Pittsburgh – The Steelers will need a lot of help this week, but getting a win shouldn’t be much of an issue against a Cleveland team that has lost six in a row. Pittsburgh has looked the part of a playoff team down the stretch, and even if the Browns come to play and compete, the Steelers should be able to find a way to win at home. Green Bay at Chicago – It’s as simply as it gets in the NFC North, the winner of this game goes to the playoffs and the loser stays home. The Packers have somehow held on long enough to get Aaron Rodgers back on the field. Rodgers may be a bit rusty, but he’ll be facing a Chicago defense that was humiliated last week against Philadelphia with a chance to clinch the division. Of course, the Chicago offense is capable of putting points on the board as well, so this game could come down to how sharp Rodgers is in his return and which offense can be more effective. Denver at Oakland – Even with the loss of Von Miller and a slew of other injuries, the Broncos should be able to handle the Raiders and secure home-field advantage throughout the playoffs. It’s a rivalry game, so Oakland will be ready to play and hoping to play spoiler against Denver, but Peyton Manning won’t let his team lose focus this late in the season, especially since a loss could mean a return trip to New England, which is the last thing the Broncos want. Buffalo at New England – The Bills almost pulled out the win when these teams met back in week 1, so perhaps they’re ready to surprise the Patriots on the road, especially after an impressive shutout of the Dolphins last week. Buffalo doesn’t have an offense that can keep up if the Patriots get rolling, but they have a defensive line that can put a lot of pressure on Tom Brady and slow down the New England offense, would could keep the game low scoring and give them a chance to win. Tampa Bay at New Orleans – A win and the Saints are in the postseason; it’s as simple as that. However, New Orleans has lost three of their last four games, and the Bucs are just good enough to make things difficult for them, especially after the Saints barely survived a 16-14 game with Tampa in week 2. The Tampa offense has sputtered in recent weeks, which will make it tough to win on the road, but if they can put pressure on Drew Brees and slow down the New Orleans offense, they’ll give themselves a fighting chance. San Francisco at Arizona – The defending NFC champs can rest easy knowing they’re in the playoffs, but there’ll be nothing easy about a trip to Arizona, especially with the Cardinals riding high from their win in Seattle last week and knowing that they need to win to give themselves a chance to reach the postseason. The Cardinals have the top rushing defense in the NFL, so if they can slow down the San Francisco running game it’ll put more pressure on Colin Kaepernick to move the ball with his arm, which isn’t necessarily what the 49ers want. Of course, Arizona will also have to move the ball and score points, while avoiding four turnovers like they had last week. Kansas City at San Diego – The Chargers need a win and some help to get into the playoffs, but they should feel good after winning four of their last five games, including a road win over the Chiefs. Meanwhile, Kansas City knows they’ll be playing a road playoff game next week, and they also know that they need to get their act together, as the only teams they’ve beaten in the last six weeks and Washington and Oakland. The Chiefs are no longer dominant on defense, which will make it difficult to stop Phillip Rivers and win this game. This should be a good practice game for next week, but if the Chiefs can’t rediscover their incredible pass rush from earlier in the season, they’ll not only have trouble beating San Diego, but they’ll also enter the playoffs on a downward spiral and void of confidence. St. Louis at Seattle – The Seahawks need to shake off a home loss from last week and get ready for a St. Louis team that has proven they can go toe to toe with some top teams. Seattle is in fine shape on defense, but their offense has had some trouble in previous weeks, which could cause problems against a great Rams pass rush. St. Louis doesn’t have anything to play for except trying to finish the season at .500, but is the Seahawks lose it could cost them home-field advantage throughout the playoffs and possibly the division, which could take them from being the NFC favorite to a team that needs three road wins to get to the Super Bowl, so it’s imperative that Seattle finds a way to win this game. Philadelphia at Dallas – The winner goes to the playoffs while the loser goes home, just the way it should be in the NFL regular season finale. All the focus has been on the health of Tony Romo, but ultimately this game will be decided by whether or not the Dallas defense can slow down the Philadelphia offense, which has looked close to unstoppable in recent weeks. The Cowboys have been deplorable on defense the second half of the season, and it won’t matter who’s playing quarterback or what their offense does if they can’t find a way to get stops, or at least force turnovers, which has been tough for any defense to do against Nick Foles this season. If Dallas expects to make the playoffs, their defense will have to make some kind of positive contribution, or else the Eagles and their high-powered offense will soar into the postseason.